There’s so much to fall in love with in Paris: the history, the architecture, and of course, the cuisine. The 13 Wine Spectator Restaurant Award winners below enhance the magic of French dining with stellar wine programs that deliver experiences to match the grandeur of the city. From a family-owned bistro to high-end hotel eateries, these wine restaurants shine bright in the city of lights. 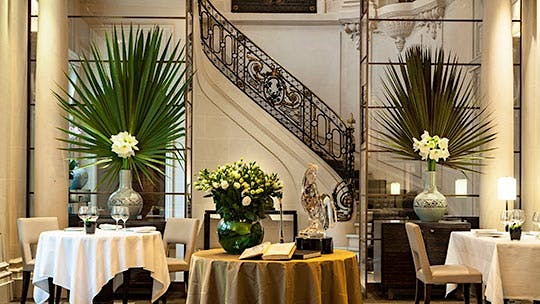 Epicure is housed in the opulent Le Bristol Paris hotel, which first opened in 1925. Wine strengths Head sommelier Bernard Neveu manages the wine list, which is entirely French except for a few pages of international labels. Burgundy is the strongest region, with nearly 200 grand cru reds alone. Additional highlights include Champagne, Bordeaux and the Rhône. Above and beyond The team takes extra steps to ensure the best possible wine experience at Epicure. 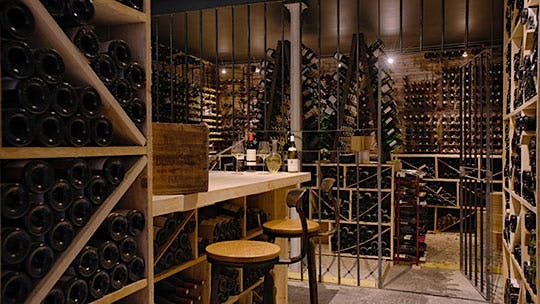 Each of the hotel’s dining outlets has its own cellar to avoid disturbing the wines with excess movement, and every selection on Epicure’s list is sourced from Neveau’s personal connections with winemakers. Cuisine Chef Eric Frechon puts a modern spin on dishes firmly grounded in French cuisine, stuffing macaroni with black truffle, artichoke and foie gras, and serving lemon-thyme langoustines with an onion-mango condiment. Noteworthy neighbors Le Bristol shares the block with the Elysée Palace, the official home of French presidents since 1848, as well as other cultural landmarks like Boutique Pierre Cardin and Christian Lacroix. At Le Taillevent, a seasonal menu complements a world-class collection of French wines. Going strong André Vrinat opened the restaurant in 1946, and his family maintained ownership until the Gardinier family purchased it in 2011. Seventy-two years after opening, Le Taillevent remains at the top of its food and wine game. It has maintained a Restaurant Award since 1984, longer than any other winner in Paris. Wine strengths Antoine Pétrus is the general manager and wine director of the overwhelmingly French cellar. The Bordeaux and Burgundy sections are exceptional, with 12 vintages of Château Latour and more than two dozen labels from Domaine de la Romanée-Conti. Picks in Champagne, the Rhône, the Loire and Alsace are also outstanding. Cuisine Chef Alain Solivérès serves seasonal French dishes with creative touches, like tomato jelly with lobster, and garlic flowers atop turbot cooked in butter. Occasionally, Solivérès will create a special tasting menu, like a recent one with a focus on black truffles. 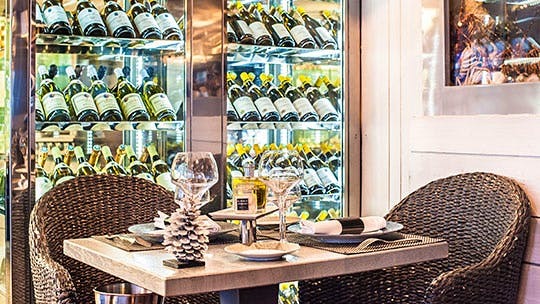 Restaurant Award–winning sibling Le Taillevent’s sister restaurant, Les 110 de Taillevent in London, holds a Best of Award of Excellence for its 1,300-label wine list and 110 wines by the glass. Les Climats serves contemporary takes on French cuisine. Wine strengths Built by owner and wine director Denis Jamet, the list exclusively features Burgundy labels. The 250-page hardcover book is a work of art itself. The wines are listed by village, displayed with corresponding maps from 1952 drawn by Sylvain Pitiot and Pierre Poupon that outline each grand and premier cru and provide details on the vineyards. While Burgundy is known to be pricey, Jamet ensures there are plenty of values to be found in the lesser-known climats. Cuisine Chef Julien Boscus creates luxurious dishes that are rich but not overwhelming: Roasted duckling is balanced by pickled vegetables and a bitter blackberry sauce, and a purée of mint and zucchini complements rack of lamb. Desserts include a chocolate biscuit with red-currant gel and a Kalamata olive ice cream, and seasonal red berries with a creamy tarragon mousse. Traditional with a twist The décor is art nouveau in style, with stained-glass windows, intricate woodwork and playful touches like leopard-print carpeting and red velvet chairs. There’s also a secret garden terrace that can seat a small number of guests during lunch. Sip, shop and learn The restaurant has a wine boutique just around the corner, La Cave des Climats. In this multipurpose space, guests can come in for a quick glass of wine and a snack, or select a bottle to take home. The shop also hosts private events and offers several formats of wine-tasting programs for $55 a person. 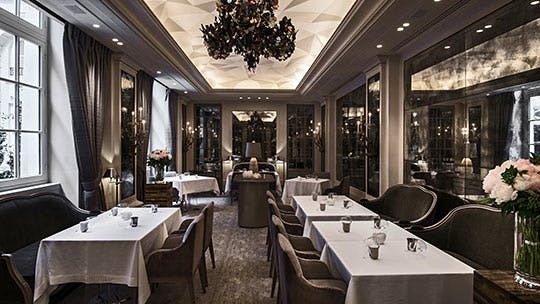 Tour d’Argent has the largest wine inventory of any Restaurant Award winner in Paris. Homage to heritage André Terrail purchased the restaurant in 1911 and supplemented the already-strong cellar with wines he’d acquired from the famous Paris restaurant Café Anglais. 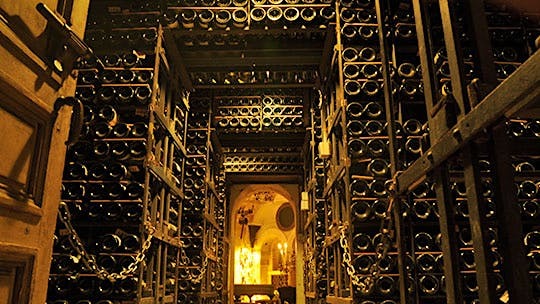 By the time his son Claude came to work at the restaurant, the cellar held 130,000 bottles, which grew to 270,000 by 1986. Today Claude’s son, André, operates the restaurant. 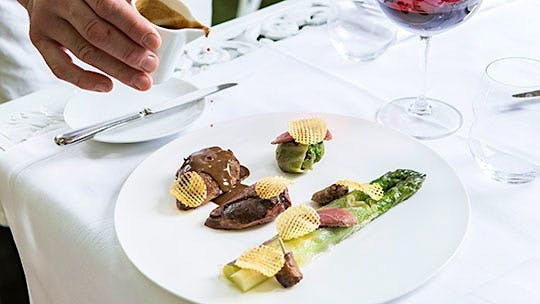 Tour d’Argent honors its past with a five-course duck menu named for the onetime owner, Frédéric Delair, as well as a dish of foie gras with whole truffle using a recipe from the historic Café Anglais. Wine strengths The wine list is all French—with the exception of an impressive collection of Port—excelling in Bordeaux, Burgundy, the Rhône, Champagne, Alsace, the Loire, Provence and Languedoc-Roussillon. Wine director David Ridgway manages the program. 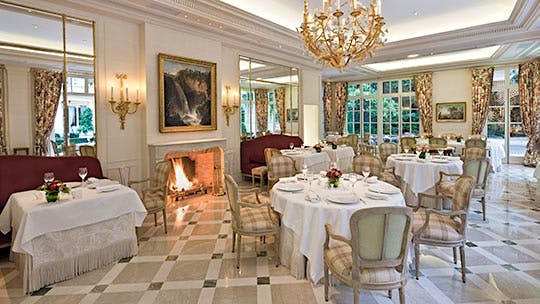 Cuisine Champagne-born chef Philippe Labbé expertly executes classic French fare. Appetizers include sun-ripened tomatoes and grilled foie gras for two; main courses are divided into fish and meat dishes made with local ingredients and traditional sauces. Jaw-dropping verticals Though Tour d’Argent boasts the biggest Restaurant Award–winning wine list in Paris, André Terrail doesn’t sacrifice quality for quantity. The massive list is filled with numerous notable verticals like 42 vintages of Château Lafite Rothschild going back to 1875, 43 vintages of Château Latourgoing back to 1899 and 43 verticals of Château Mouton-Rothschild going back to 1918. Chef Thibault Sombardier’s menu at Antoine is an elegant showcase of fresh, local seafood. Wine strengths Head sommelier Fabien Vullion built the wine list, which shines in French regions such as Burgundy, Champagne and the Rhône. While the selections are almost entirely French, you’ll find a handful of wines from South Africa, Austria, Spain and other regions. Cuisine Chef Thibault Sombardier takes great care in sourcing ingredients for his seafood-centric French menu. 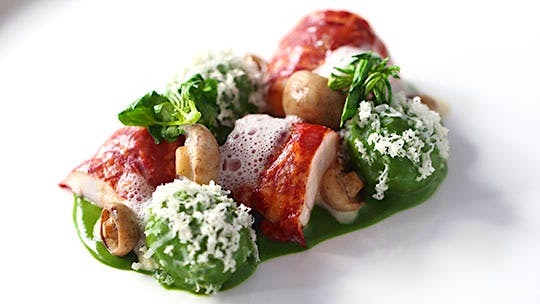 Examples of dishes include lobster soufflé and langoustine smoked in pine, as well as items from the land, like veal sweetbreads with capellini. Straight from the sea Fish is sourced from ports along the Mediterranean Sea, and the menu changes daily to highlight the freshest ingredients possible. Riverside dining The restaurant is set on the banks of the Seine, so guests can enjoy views of the river and the bustling walkway that runs alongside it. 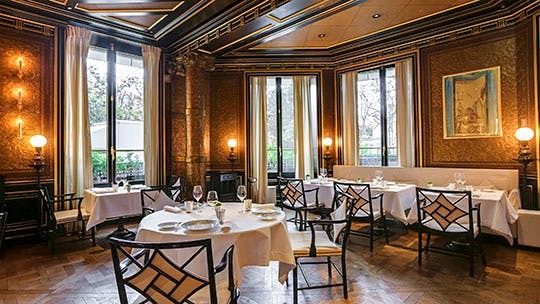 L’Ecrin’s dramatic dining room sets the stage for an exclusive tasting menu. Wine strengths Wine director Xavier Thuizat’s program focuses on France, excelling in Burgundy and the Rhône, with nearly 200 Champagnes and an incredible collection of Bordeaux. 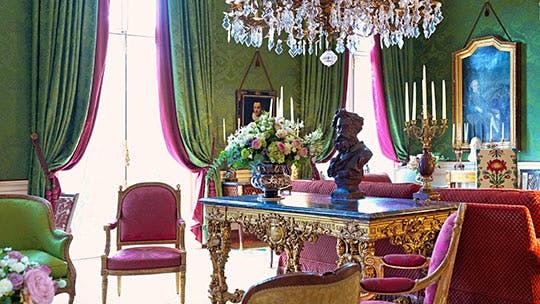 Reimagined resort In 2013, Hôtel de Crillon auctioned off thousands of bottles in preparation for a four-year renovation, and Thuizat was tasked with rebuilding the wine program from the ground up. During the closure, he embarked on a global excursion to source unique and diverse labels, visiting more than 35 countries before the hotel reopened July 2017. Cuisine Only 24 guests a night experience chef Christopher Hache’s French tasting menu of seven courses for $125 or 10 courses for $305, with beverage pairings available for $110 or $150, respectively. There’s also a higher-end beverage pairing experience for $140 for the seven-course menu or $250 for the 10-course. Dishes for summer 2018 include squid with black garlic and turbot with kimchi. Size variety L’Ecrin offers a range of wine options outside the traditional 750ml bottle. There are strong by-the-glass selections from producers like Bott-Geyl, Michel Redde and Lucien Le Moine, half-bottles from Bordeaux Grands Crus and more than 50 large-format selections. Le Clarence honors French dining traditions with a hint of modernity. Wine strengths The wine program consists of exclusively French selections, with highlights in Bordeaux, Burgundy and the Rhône. Winery ties The restaurant is part of the family-owned company Clarence Dillon Wines, which produces the Bordeaux wines of Château Haut-Brion, Château La Mission Haut-Brion and Château Quintus. Le Clarence is housed in a 19th-century mansion that also contains a hotel. Two-tier format The wine list is divided into the Domaine Clarence Dillon wine list of 500 selections sourced straight from the estates—including a 26-bottle vertical of Haut-Brion Pessac Léognan—and a list of 1,200 labels from various French regions. Cuisine Chef Christophe Pelé’s style is contemporary and seasonal. Guests can choose from three courses for $150, five courses for $220 or seven courses for $370. Subtle Japanese influences meet French tradition at Le Gabriel. Cuisine Chef Jérome Banctel infuses Thai and Japanese flavors into his French menu of dishes like salmon with eggplant, pollen and spring honey, and sea bass with celery, lemon and wasabi. Wine strengths French picks dominate the program helmed by wine director Aurélien Gil-Artagan, with standouts in Bordeaux, Burgundy, the Rhône and Champagne. International influence Le Gabriel champions wines from outside the country as well, featuring labels from Spain, Switzerland, Germany and more, enhanced by a diverse sommelier team hailing from Japan, Canada and France. In the business The hotel’s owner, Michel Reybier, is the proprietor of Château Cos-d’Estournel in St.-Estephe, Bordeaux, and Hetszolo in Tokaj-Hegyalja, Hungary. The wine list leads with selections from these estates. Wine strengths Wine director Pierre Vila Palleja added 250 selections to the list between 2017 and 2018, increasing the inventory by 1,000 bottles. There’s now an even stronger collection of French wines, especially in Burgundy, the Rhône and the Loire. Cuisine Chef Nicolas Bouiller serves iconic French dishes like beef Bourguignon and charcuterie on the bistro side of the restaurant, and more upscale plates like 36-hour veal confit and a tart with marinated mushrooms and aubergine caviar in the main dining room. Somm-selected sales The restaurant sells some of the wine team’s favorite labels at discounted prices for guests to take home. Selections change seasonally, but August 2018 offerings include Alain Graillot Crozes-Hermitage White 2016 and Domaine Clusel-Roch Côte-Rôtie 2015, each for $57. Team effort Pierre’s parents, Jacqueline and Raymond Vila Palleja, own the restaurant. Jacqueline also serves as general manager for the family business. 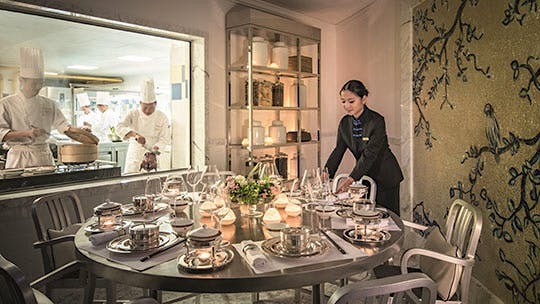 Up to six guests can experience the eight-course tasting menu at LiLi’s chef’s table. Wine strengths Head sommelier Nicolas Charrière oversees the wine list of mostly French selections that stand out in Burgundy, with several grands crus from producers like Ramonet and Bonneau du Martray. Charrière offers similarly strong picks from Bordeaux and Champagne. Cuisine Chef Peter Wing Tak Ma puts a high-end spin on Cantonese classics like Kung Pao chicken and sweet-and-sour pork loin, plus a variety of dim sum. Fusing cultures LiLi brings Asian inspiration to Paris not only through its menu, but also in its aesthetic, which features rich red and gold tones and traditional Chinese opera costumes on display. There is also a wide selection of Chinese teas. Central spot The restaurant is located in the Peninsula Paris, just two blocks from the Arc de Triomphe, with easy access to other major attractions like the Seine river and Champs-Élysées. 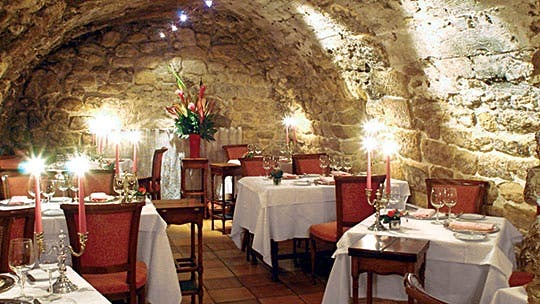 At Restaurant La Truffière, guests can dine in the 17th-century wine cellar. Wine strengths Chef-owner Christian Sainsard also manages the wine program. The highlight is an impressive selection of Bordeaux, which spans 36 pages and includes 40 vintages of Château Mouton-Rothschild. Burgundy, the Rhône, Languedoc-Roussillon and Italy are also well represented. Cuisine Chef Christophe Poard executes Sainsard’s French dishes that change seasonally, like sea bass tartare with ponzu and smoked beef fillet with herbs. Items are available à la carte, but the restaurant is known for its black truffle tasting menu of eight courses for $210. Industry veteran Sainsard started working in restaurants at the age of 15 and spent time in major establishments like Grand Award winner Enoteca Pinchiorri in Florence, Italy, before opening Restaurant La Truffière in 1984. Online shop The restaurant has its own online store, A.B.C. Du Vin, that sells wine and some of its carefully-sourced truffles. At Vantre, most of the 12,700 bottles in the cellar are French. Wine strengths Overseen by wine director Thomas Simian, the program is a comprehensive collection of wines from top French regions, with a few international selections. Burgundy and Bordeaux are the biggest strengths, followed by the Rhône, Champagne and the Loire. Cuisine Chef Iacopo Chomel’s menu changes daily to showcase regional cuisine, but past dishes include veal tartare, and roasted Guinea fowl with Jerusalem artichoke and red cabbage. History of success Before opening Vantre, owner Marco Pelletier served as head sommelier at several Grand Award winners in Paris, such as Le Taillevent and Epicure. Sweet ending Dessert wines are another draw at Vantre, where you’ll find sweet selections from a diverse range of top producers such as Magnotta and Disznókő. Some of the 9,500 bottles at Le Bar à Huîtres Montparnasse are on display in the dining room. Flagship location The restaurant is owned by Garry Dorr, whose collection of Paris eateries encompasses 10 other Restaurant Award winners including three other locations of the oyster-centric Le Bar à Huîtres: Place des Ternes, Place des Vosges and Saint Germain. Wine strengths Wine director Maxime Barreau manages the programs at all of Dorr’s establishments. At Le Bar à Huîtres Montparnasse, Barreau built a global list emphasizing France. In addition to major French wine regions, the list also has labels from Japan, Israel and Lebanon. Cuisine Chef Remy Robert executes the menu of simply prepared seafood like skewers of fresh scallops and wild prawns, grilled squids with chorizo, and plenty of daily catches. Unrivaled oyster selection The restaurant’s claim to fame is its oyster selection from more than 30 prime growing locations in the Mediterranean and Atlantic. To keep seafood as fresh as possible, there’s a 1,500-liter aquarium on site to store the oysters along with crustaceans and fish. Posted on August 17, 2018 August 17, 2018 by Michael StevensonPosted in Food & WineTagged Paris, vin, wine.